Pokémon Go and Small Business Funding - Getting your business closer to your customers. Let us get familiar with Pokémon Go craze. Pokémon Go is an amazing business-friendly mobile game. Using GPS and camera phone, it finds out the Pokémon Go player’s (known as Pokémon trainers) location and superimposes an unreal Pokémon in the real world. In order to track down the animated and cute little monsters called Pokémon, the users pilot their towns and cities. Therefore, there is a high possibility for Pokémon players to navigate through your business doors and eventually become your customers. Put it simply, this app facilitates small businesses such as restaurants, theaters, hotels, salons, spas, gyms, hospitals, etc. to hook up with novel customers. Thus, assisting as a great marketing strategy, it can extraordinarily augment your business’s social media engagement or business sales. Get a PokéStop for your business – When you get a Poke Stop for your small business, it is noted by a blue cube on the Pokémon Go user’s map, representing a place to gather. When the users (also known as Pokémon trainer) dab your Poke Stop, they will be able to notice the business details provided by you. This is useful for making known your business to the world and in due course, draws customers. Lure the customers and Pokémon, the “Lure” way – Run a “Lure” for your business, as it pulls in Pokémon to any Poke Stop (your business place) and holds them about 30 minutes for loosely $1. Players, keying out your business as a Poke Stop, walk in to catch Pokémon and become your would-be customers. Encourage individuals to play at your business – Bring into play all your social channels, hold a contest and entice people to play at your business location by offering prizes to the winners or winning teams. Such an approach not only betters the social media engagement, but also betters the sales. However, ensure to follow all the rules on each social network strictly. Invite users to tag their photos – Tempt players to contribute photos of Pokémon that they have caught at your business location and allow them to tag your business in the post. This way, your small business can enjoy a decent amount of social exposure. Thank your customers for any public mentioning of your business, to connect with them on a deeper level. Propose complimentary Wi-Fi and mobile charging stations – For the Pokémon trainers or players to play at your business place, two things are very imperative- Wi-Fi and charging points. Hence, offering these essentials free of cost is the best way to gain new and sustain old customers. Additionally, to make players feel more welcome to play, let them know the rewards at your business through social platforms and window signage. Film Pokémon trainers in action – Get permission from Pokémon players to shoot them in action. Film their hunt for Pokémon and upload videos later on to your social sites such as Facebook, Instagram, etc. Run an exceptional Pokémon inspired business promotion – Put on show your understanding of Pokémon Go craze by carrying out an eye catchy Pokémon-themed business endorsement. A head-turning advertising can transform mere readers into trustworthy clients. Incentivize customers for taking Pokémon pictures with your products – Motivate your customers to aim Pokémon on your business products that they hope to purchase. Incentivize such individuals by allowing a special discount for sharing Pokémon photo with your business product tagged. If needed, show your customers how to do it on your social profiles. Alternate Gym discounts – Different from Poke Stops are the Pokémon Gyms where three distinct teams- Valor (Red), Mystic (Blue), Instinct (Yellow) combat with each other to have power over the gym. Thus, you can offer discounts to the controlling team, which can be a chief attractive feature for players. 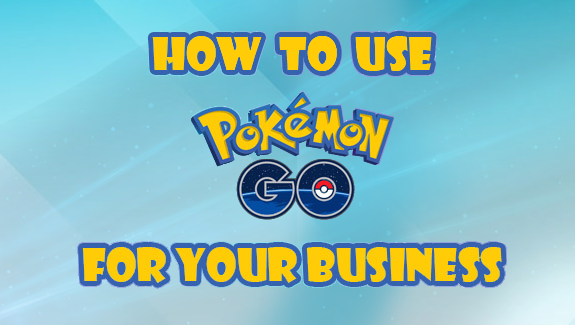 Get to the nuts and bolts of Pokémon Go and gear up your small business for stupendous customer traffic. Capitalize on the new trends in the marketing strategy and lending industry that can be critical to your business’s growth. Adopting such trends can help create brand awareness and grab remarkable business opportunities. However, if you need working capital to expand your business in order to accommodate the growing scores of customers, you can bet on small business financing from Business Capital USA. Get into action, employ the power of Pokémon Go marketing and cash advance loans combined and achieve an unmatched business success.